A common reason people wind up giving up pets to shelters is because they can no longer afford to care for them, and being able to get pet food at food banks can be a big help. That’s why the Vegetarian Resource Centre is collecting donations of pet food for food banks in exchange for cupcakes on Saturday, July 20th. That’s right: we’re offering a free cupcake for every donation of pet food you bring in! What? 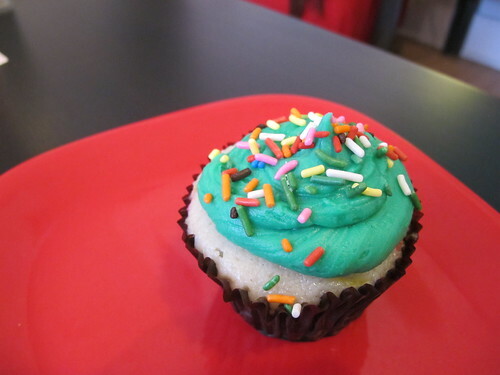 Get a free cupcake for each donation of pet food you bring in! While supplies last. Questions? Email admin@veg.ca. If you prefer to purchase only vegan dog food, in Toronto you can find it at Timmie Dog Outfitters or have a Global Pet Foods order some for you. Posted June 12, 2013 by TVA. Filed under News, Uncategorized.